Off To The Autism Resources Miramichi AGM! I am thrilled to be heading off shortly for Miramichi to attend the Annual General Meeting of Autism Resources Miramichi Inc. at 139 Duke St. Starting at 12:00 noon. ARM has been kind enough to offer me an opportunity to speak and provide an overview of the history of autism advocacy in New Brunswick over the past decade and to address our most pressing need .... adult autism care. Lila Barry of ARM is a former Autism Society New Brunswick president and was one of our most active and effective advocates for autism specific early intervention and school services and accommodation. It will be great to see Lila and her family and other friends from the Miramichi. I will head up early so that I can drive slowly and hopefully see some opportunities to take a few pictures along the way. If anyone from the area reads this blog I hope to see you at noon today! 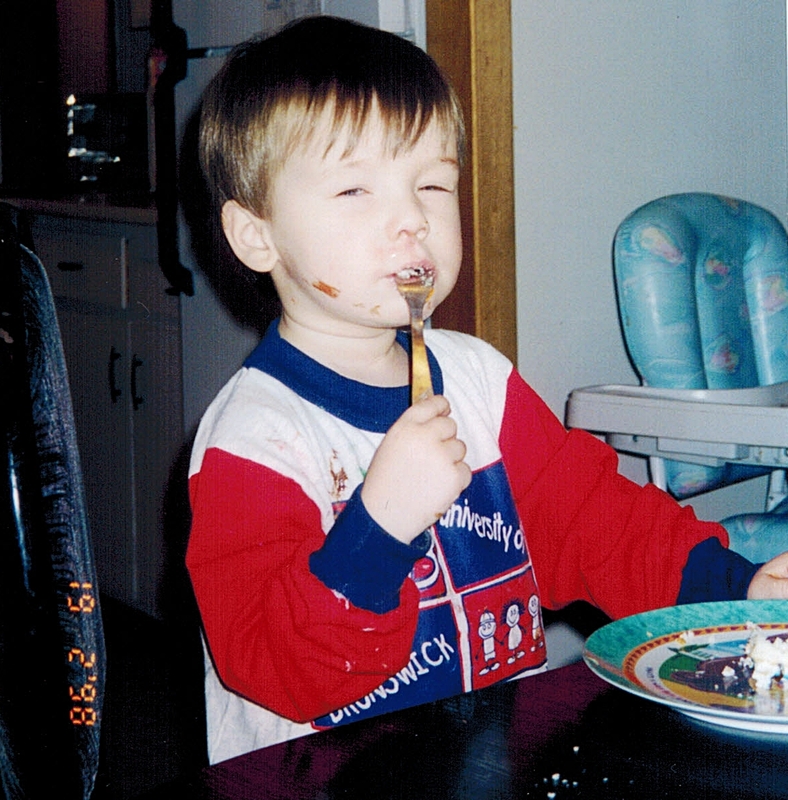 Yesterday was Conor's 17th birthday. 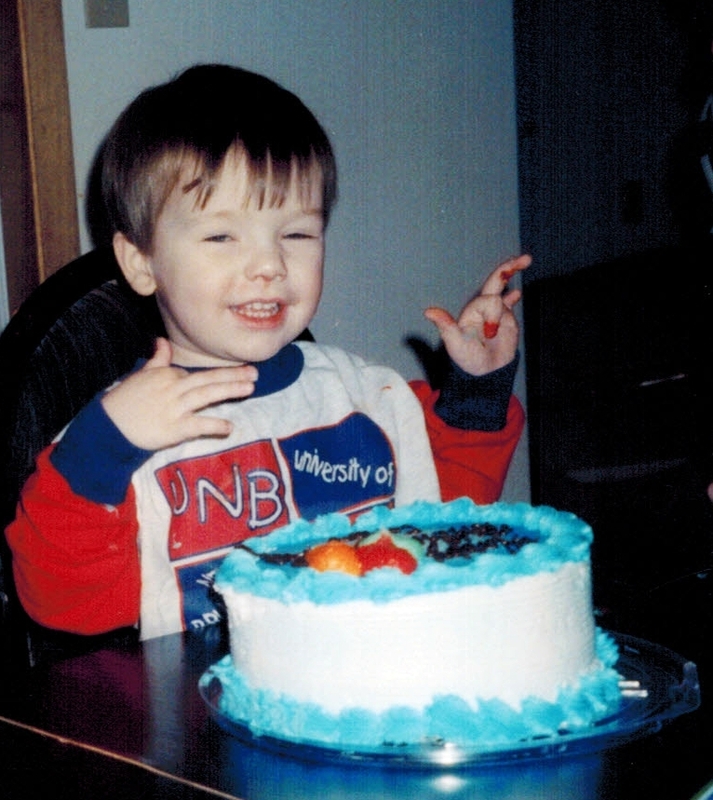 Today is exactly 15 years since he was diagnosed with an autism disorder, PDD-NOS, the day after his second birthday shown in the pictures above. Shortly afterward he was re-diagnosed with Autistic Disorder, and he was also subsequently assessed with profound developmental delays. I can't say that I am overly impressed with the research into autism causes, treatments or even our understanding of what constitutes autism that has taken place in the last 15 years. 15 years ago intensive early behavioral intervention was the only seriously evidence based intervention for autism as it remains today. 15 years after Conor's initial diagnosis there are no substantial breakthroughs in understanding the biological basis of autism as the goal posts keep getting moved to allow the dominance of genetic autism research to continue and to continue with the lion's share of research dollars. Today, like 15 years ago, possible environmental contributors to autism are largely ignored and receive only a small fraction of the autism research dollars available. Even our understanding of autism diagnostic criteria are about to change again and for what reason? The DSM5 does not hold out any serious hope of increasing our understanding of autism disorders, symptoms, causes or possible treatments. The DSM5 will undoubtedly muddy the waters of autism research even further. Debates still rage over whether the astonishing increases in autism diagnoses of the last 15 years are real or whether they are caused by increased social awareness and ... the diagnostic definition changes of the 1994 DSM-IV. NOW in Conor's 15th year post autism diagnosis yet another definition will be forced upon North Americans? How can this possibly help autism research? Services have been obtained for autistic children in various parts of North America in the 15 Conor autism years. Here in New Brunswick I joined with other parents fighting for early intervention, school and services for autistic adults. We made significant gains in early intervention service delivery as recognized by Dr. David Celiberti of the Association for Science in Autism Treatment and in our schools. In adult care nothing has changed as yet, nothing at all. Here in New Brunswick, Canada, we still dump our severely autistic adults in hospitals, jails, hotels and foreign facilities rather than develop our own enhanced adult autism network. Many others live in group homes with untrained staff. The gains we made in early ntervention and schools are being eroded and adult care has not been addressed at all. If I sound gloomy I don't intend to be. I will advocate for Conor as long as I am alive and I can only do so by being honest. His autism challenges are real and I will not betray him by pretending that his autism is a joy. Conor himself is a tremendous joy and the proof is in the pictures you can find on this blog site and on my Facebook page which is open to public view. See for yourself. Conor's autism is no joy but he sure is. Conor is 17 today! It's his birthday Smurfday as we ordered a birthday cake at the local Superstore featuring the Smurfs, currently his favorite movie which we have recorded on our television DVR function. (Dad has seen it a few times too, little disappointed Gargamel wasn't on the cake, just kidding!). The "cake" is actually made of 20 cupcakes with an icing layer across the top. Conor's birthday is also known as spoil Conor silly day in our house and he has picked out Greco pizza for supper. Long time members of the Autism Society New Brunswick, particularly those from the Fredericton area, will recognize in the picture above former NB'er Linda Murphy and her daughter Ashley who has severe autism and is now 19. They are featured in Autism's New Frontiers PART 2: ‘The bridge to nowhere'. A few years ago Linda and Ashley moved from New Brunswick to Ontario. The excellent Ottawa Citizen article looks at the "fractured" adult autism care system in Canada, although personally I think it might be a bit of a stretch to call it a system at all whether looked at nationally or provincially in Ontario (or New Brunswick). The harsh reality to date is that Canadians and our political leaders have shown little interest in providing a serious, modernized adult autism care system. The gaps in service, which exist to varying degrees across the country, raise profound questions about what level of care and support Canadians are willing to give adults on the spectrum, whose abilities and needs are wide-ranging. “Right now, this logic that it will fall on the families first and we’ll pick up the disaster later is causing all kinds of suffering that’s unnecessary,” says Herb Emery, a health economist at the University of Calgary who’s studying the issue. " The gaps in service are very evident here in New Brunswick. A group home system with staff lacking autism training is supplemented only by permanent transfer to psychiatric institutions in Campbellton and Saint John. Neither the New Brunswick government nor its non elected partner the New Brunswick Community Living Association, which determines many of the NB government's social policies, want to establish an enhanced adult autism care network as proposed by NB autism expert Paul McDonnell. The McDonnell proposal would see a facility in Fredericton near the autism expertise of UNB, UNB-CEL and the Stan Cassidy center which could provide permanent long term care for those with severe autism needs and could also provide expert assistance to the community based group homes. Money is only part of the problem. NBACL and the NB Government prefer to simply ignore the real life suffering of those with severe autism who do not fit into their rigid adherence to failed, non evidence based, community inclusion models. Rather then construct an actual place for severely autistic adults to live under expert care they prefer to abandon them to general hospitals, psychiatric hospitals and foreign facilities most notably the Spurwink facility in Maine. Linda Murphy was among the parents who fought for early autism intervention and autism trained aides and teachers in New Brunswick schools while in New Brunswick. Hopefully her advocacy for adult autism care in Ontario will help improve the lives of autistic adults like Ashley. Meanwhile, here in New Brunswick we too will continue the fight. Not because we want to but because we have no other choice. Good luck and best wishes to Linda and Ashley. Together with New Brunswick's foremost autism expert, clinical psychologist and UNB Professor Emeritus (Psychology) Paul McDonnell, I enjoyed a visit to NB NDP headquarters on Prospect Street in Fredericton this afternoon for a direct, candid and open minded discussion about autism services in New Brunswick with NDP leader Dominic Cardy and NB NDP Executive Director Amanda Francis. We covered a lot of ground with Paul reviewing early intervention, school and adult care autism services along with the parent advocacy that led to those services being provided. (I chimed in on occasion). In fact everyone contributed to the discussion. It was refreshing to discuss autism issues without having to break through a fixed mindset. Mr. Cardy's office had responded promptly to the February 7. 2013 Autism Society New Brunswick invitation to attend our AGM and Ms Francis indicated Mr. Cardy would be pleased to meet with us. With all the news breaking this week of the NDP role in the anti-patronage bill and former Liberal Minister Kelly Lamrock joining the NDP I was fully expecting a postponement of the meeting. The meeting went ahead though and it was everything you could hope for in discussing a cause, in our case autism, with a political leader. 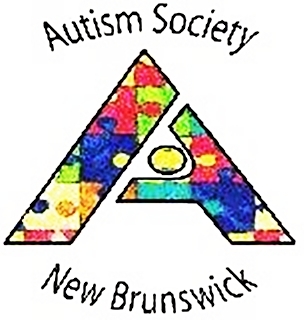 Mr. Cardy also re-affirmed his commitment to attending the Autism Society New Brunswick meeting at UNB Fredericton, MacLaggan Hall on March 23 beginning at 12:30. On behalf of ASNB I want to thank Mr. Cardy and Ms. Francis and say that we look forward to continuing the discussion! 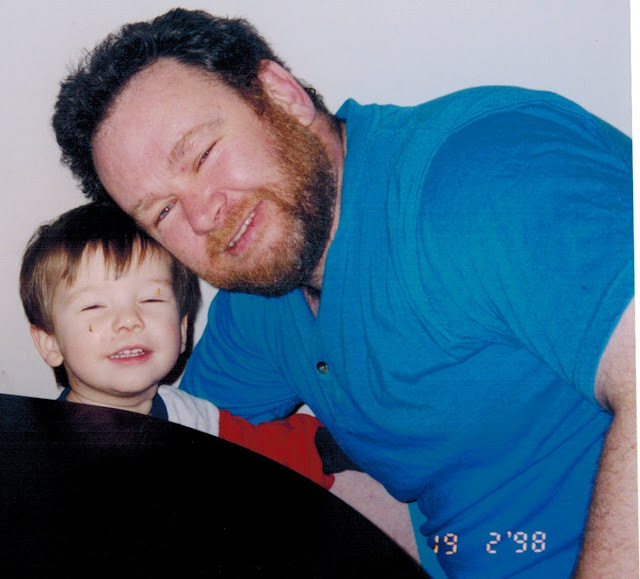 Seizures and epilepsy are serious issues for persons with autism and their families as we learned first hand in our home on November 17, 2012 when Conor suffered a very serious seizure. Following is a publicity release issued in respect of Silently Seizing and author Caren Haines, RN (Haines also received input from Nancy Minshew MD) which I am pleased to publish on this site. I encourage everyone to read this release and consider using any media or social media you can to further its distribution and awareness of seizure issues for persons with autism disorders. Newark Valley, NY, February 15, 2013 – Many of us know someone whose family is dealing with autism; once considered rare, now 1 in 88 children in this country are diagnosed with an Autism Spectrum Disorder (ASD). 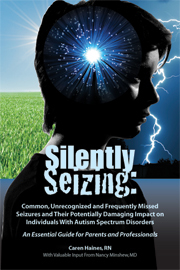 Backed by up-to-the-minute research, Silently Seizing: Common, Unrecognized and Frequently Missed Seizures and Their Potentially Damaging Impact on Individuals With Autism Spectrum Disorders is a must-read book that includes sections describing autism, the seizure-autism connection, tips for diagnosing and treating seizures, as well as how to better understand children's behavior. It acts as a virtual guide to help parents navigate through this complex and mystifying disease. For more information, please visit: www.bit.ly/Rb2WBW. Caren Haines is also co-author of Georgia, The Flying Dog, a children’s book that explores the concept of unconditional love and acceptance of our differences. When: February 28th, 2013 - Ms. Haines' presentation is from 11:00 am – 12:15 pm; immediately following she will be at the AAPC booth signing books. ADDITIONAL INFORMATION: Hosted by: Georgia Autism Conferences and Exceptional Ed Events. Georgia Autism Conferences strives to meet the needs of the Georgia Autism community by providing quality seminars and conferences throughout the state on topics related to Autism Spectrum Disorders. As an Autism Society New Brunswick representative I attended a meeting held at the Restigouche Regional Hospital Centre a few years ago to participate in a meeting to review the operations of the RRHC and to vote on its future, specifically whether to continue to operate or to close. I voted to continue to operate the RRHC. There were autistic adults who had been living there for many years. No alternative in New Brunswick then existed for these adults with severe autism challenges. The vote was conducted and reluctantly agreed to by me, and all other stakeholders present, because no alternative accommodations existed in NB for the residents of the facility. Today no alternative has been developed despite representations made to government over and over and over again. I totally agree with you Harold. When I was minister of FCS we had to use facilities in the State of Maine at an annual cost of $300,000 per person. I had planned on pursuing the initiative you speak of using the State of Maine model...this would keep the autistic person closer to home in familiar surroundings, it would create employment so that the $600,000 now spent in Maine could be used to pay for these services at home. As you know, my efforts were derailed and I had to resign as minister. These financial facts I speak of need to be brought to the attention of the present government...perhaps they will see the light. Keep up the fight and I personally wish you the very best of luck. Tony Huntjens was a cabinet minister during the Lord government years and showed himself to be a true friend of New Brunswick's autism community as he remains to this day. Although not a member of the legislature, or the current government he has continued to be a supporter of children and adults with autism. I attended a meeting with a minister of the current administration on adult care over a year ago in which Mr. Huntjen advocated forcefully for autistic adults in New Brunswick. His efforts, and those of everyone who attended the meeting were not met with any results by this current government which believes that all needs of autistic children and adults can be addressed by feel good cliches about community and inclusion. His comments 13 months ago on this site are an accurate reflection of what took place almost a decade ago. The adult autism care he described then remains largely unchanged today. Things were so bad then that an autistic boy was housed on the grounds of a youth correctional centre, a jail, before being sent out of the country to the Spurwink facility in Maine where the $600,000.00 annually that Mr. Huntjens spoke of was being spent. Matters have not improved under the current Alward-NBACL government. Things were bad then and ... they are not one bit better today. Social policies including early intervention, education and adult residential care policies are now set largely by the New Brunswick Association for Community Living which has extremely close ties to the current government. Despite the wonderful sounding name NBACL turns its head the other way when autistic children are excluded from New Brunswick schools and autistic adults are sent to live on general and psychiatric hospital wards ... if they have anywhere to live at all. The Autism Society New Brunswick made representations annually to the Lord, Graham, and the Alward government, to develop a modern, humane autism residential care network as described by autism expert Paul McDonnell a Psychology Professor Emeritus and practicing clinical psychologist who was instrumental in the autism progress New Brunswick made in the pre-Alward era. Unfortunately the Alward government has not seen the light as Mr. Huntjens had hoped. New Brunswick adults with autism and their families have no reasonable basis on which to believe that their needs will be met, or that their voices will even be heard (1a,b), during the reign of the current administration. For New Brunswick youth and adults with severe autism challenges inclusion and community living are simply cliches uttered incessantly by those who pretend to care about their well being. I also advocated for adjustments to the total inclusion education model in our schools. My son's self inflicted bite marks on his hands and wrists declined and disappeared entirely once removed from the mainstream classroom where he was overstimulated, overwhelmed, frustrated and learning nothing because of his serious autism deficits. I have been a determined opponent of the excessive dominance in our schools and facilities of rigid, ideologically based inclusion and community models. This mindset discriminates against severely autistic persons by failing to accommodate their real needs. Our children have, at times, been sacrifices to the vanity of a community movement which can not adjust to differing needs, experiences and expertise. I participated in regular disability committee meetings held by the Department of Education until they were disbanded, the MacKay review and the Ministerial Committe on Inclusive Education. Believe me or not but many teachers and teacher representatives have told me in confidence that they shared my aversion to the rigid inclusion model which has caused considerable suffering to some children and has disrupted the education of others unnecessarily. My son has been accommodated because of my advocacy and because educators who dealt directly with my son were conscientious, could see what he needed and acted in good faith to help him. I know that not all severely autistic children have been as fortunate. On behalf of Minister Dubé, I acknowledge receipt of your email. Please be assured that it will be brought to her attention. Thank you for taking the time to write to the Minister. A study presented at the IMFAR 2012 conference this spring in Toronto, Underdiagnosis of Autism Spectrum Disorders in Individuals with Intellectual Disabilies, seems to provide evidence contradicting the widely propagated assertion that the DSM-IV era has seen autism incorrectly diagnosed as a substitute diagnosis in many cases of intellectual disability. Roeyrs and Thys actually conclude that autism is UNDER diagnosed in a large study of persons with intellectual disability. If the study results are confirmed it seems likely the harmful impact of the express, and intentional, targeting for exclusion of severe intellectually disabled from the DSM5 autism spectrum disorder will be increased to the detriment of those most severely affected by intellectual disability and autism symptoms. The missing of co-occurring autism disorder in persons with intellectual disabilities, as the authors indicate, could have serious repercussions for their care and treatment. Background: Only a limited number of studies examined the prevalence of autism spectrum disorders (ASD) within the population with intellectual disabilities (ID) and even less studies tried to estimate the proportion of missed diagnoses of ASD in individuals with ID. It is however of great importance that the co-occurrence of ASD is recognized with a view to improving the quality of life of individuals with ASD and their social environment. Objectives: The first goal of this study was to estimate the prevalence of ASD in a very large sample of individuals with ID. A second and equally important goal was to identify the proportion of overlooked diagnoses in various settings for individuals with ID. Methods: The sample comprised 2798 individuals with ID and 322 individuals with borderline intellectual functioning from the 5 provinces of Flanders, the Dutch-speaking part of Belgium. The mean age was 25.6 years (SD=16.42), ranging from 1 tot 81 years. 52% of the sample was older that 18. Subjects were screened with the Scale of Pervasive Developmental Disorder in Mentally Retarded persons – Revision, a screening instrument with excellent sensitivity and specificity (Kraijer & de Bildt, 2005). Results: 633 children and adults were classified as having ASD. This is 21.1% of our sample. When the subgroup with borderline intellectual functioning was excluded, the prevalence rate increased to 22.2%. The male-female ratio was 2:1. Occurrence of ASD was higher in subgroups with more severe forms of ID. 40% of the individuals with an ASD classification had no official diagnosis previously and another 22% was only suspected to have ASD. The proportion of supposedly missed diagnoses was significantly higher in females than in males. ASD was also significantly more often overlooked in adults compared to children. In addition, diagnoses were more likely to be missed in case of an associated genetic disorder such as Fragile X or Down syndrome, a comorbid psychiatric disorder or a severe visual impairment. Conclusions: This is, to our knowledge, the largest sample of individuals with ID that was ever screened for ASD. Our study confirms that a substantial subgroup screens positive for ASD and that the diagnosis is often missed. Late diagnosis, or the failure to diagnose at all, may have unfavorable and long-standing effects for those affected and their families. For professionals in facilities and schools for individuals with ID it would seem important to bear the possibility of co-occuring ASD in mind. The recognition of ASD could lead to a better understanding of the overall problems of the clients and to more appropriate care and treatment. The video and clip below are from the Medicare for Autism Now web site and feature MFAN co-founder Jean Lewis, one of Canada's foremost autism advocates, providing an articulate, personally informed summary of the struggle for autism treatment in Canada. Jean keeps the discussion on a non-partisan level and discusses the fight to end Canada's inhumane and discriminatory exclusion of treatment for those with autism disorders in the context of other historic struggles for liberation from discrimination based on race and gender. A very important point to remember in Jean's message is that such struggles are never overnight affairs. They are essentially political wars which involve many battles before the wars are won. For those of us who are parents it is difficult but it is, and always will be, necessary to stay engaged in the battles, to continue the fight and to assist newcomers who need to join the political armies fighting for a humane, Canadian government to fulfill the promise of Medicare of which Canadians are justifiably proud and ensure coverage of evidence based treatment for autism disorders. Jean Lewis, co-founder of Medicare for Autism Now and Civil Rights Now and co-producer of Medicare’s Orphans discusses the purposes of the film — which are provide a detailed history of the autism treatment movement, and to help maintain momentum in the campaign for justice. You are all respectfully invited to attend the 2013 annual meeting of the Autism Society New Brunswick scheduled for March 23, 2012 commencing at 12:30 at MacLaggan Hall, UNB Fredericton. The meeting will be open to anyone in New Brunswick affected by or with an interest in autism spectrum disorders. The Centers for Disease Control (CDC) in the United States currently estimates that 1 in 88 persons will be diagnosed with an autism spectrum disorder (ASD). The primary diagnostic features of autism as set out in the DSM and ICD diagnostic manuals indicate three primary concerns of deficits in social, communication and restricted, repetitive and stereotyped patterns of behavior, interests and activities. Serious features often found in conjunction with autism include intellectual disabilities, epilepsy and seizure activities, sensory issues and self injurious behaviours. In our province the Autism Society New Brunswick and our parent members have been instrumental in advocating successfully for evidence based early intervention for children with autism disorders. We were actively involved in assisting in the creation of the internationally recognized UNB-CEL Autism Intervention Treatment program. Our advocacy prompted the UNB-CEL autism training of approximately 500 education aides and resource teachers. It was also the ASNB representation during the inclusive education reviews of the Lord and Graham administrations (MacKay,Ministerial Committee) that helped ensure the emphasis in the PNB definition of inclusive education on a student focused, individualized, evidence based approach to inclusive education. We have further advocated for the maintenance of a range or continuum of learning and placement alternatives in providing inclusive education; consistent with principles enunciated in Canadian case law such as the recent Moore decision of the Supreme Court of Canada and by credible autism authorities such as the TEACCH Autism Program at the University of North Carolina. ASNB and our representatives have also advocated persistently, albeit with very limited results, for systemic improvements in adult services. One key area that has repeatedly been brought to the attention of government, and for the most part ignored, is the need for an enhanced network of residential care and treatment for New Brunswick adults with autism as described by respected New Brunswick autism expert Paul McDonnell. The adult care issues are of grave concern and have not been seriously addressed in NB at all. There are also serious concerns among parents about a perceived regression in provision of early autism intervention with valuable early intervention time being lost needlessly by bureaucratic and service provider procedures. In our schools the quality and integrity of the UNB-CEL autism training has been replaced by an in house autism training model which the ASNB objected to strenuously over many years. Pressures are continually being exerted to place all students with autism disorders in regular classroom settings contrary to the legal and professional requirements noted above for a continuum or range of education settings and service delivery based on the needs of the individual students. The issues articulated are provided in an attempt at candid, courteous discussion of issues that are of fundamental importance to our ASNB members and persons affected by autism. They are provided to avoid surprise and to allow any respected invitees who choose to attend to come prepared for discussion without fear of being "bushwacked". This invitation will itself be placed in regular and social media consistent with ASNB practice of transparent, arm lengths and public approach to autism advocacy that has worked so well in dealing with previous administrations. if you choose to attend you will be welcomed on behalf of the 1 in 88 persons in New Brunswick and their families. Kindly reply as soon as possible to this email if you wish to attend so that preparations can be made to accommodate any needs, requirements or concerns you might have in attending. Anyone with an interest in, or affected by, autism in New Brunswick is invited to attend the annual general meeting of the Autism Society New Brunswick. The meeting is being held at MacLaggan Hall, UNB Fredericton, Room 53 beginning at 12:30 pm. If you are interested in attending please indicate at your earliest convenient opportunity by emailing me at AutismRealityNB@gmail.com. Look forward to seeing you on March 23! 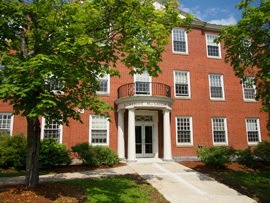 MacLaggan Hall, picture above is located in the center of the UNB map below on Dineen Dr. Parking is available at the rear of the building off of Windsor Street. HLD.